SHINDENGEN SH847- Anyone using it ? Hi guys, my r/r on my 07 1098 took a dump on me yesterday, looking to change it out and was wondering if anyone has gone around fitting the sh847 instead of the fh020aa? Yep, just did the upgrade a couple months ago. Bought the kit from here: Home. Also bought a carbon bracket from member VJ020. No issues with either transaction, installation, or function. Ive installed a few of them now. 848, 999, 1098, and this week a Hyper 1100. I would also suggest relocating the R/R to the right side of the bike. There is a TON of room, and you can put this thing in the airstream and away from exhaust heat altogether. Use the Triumph/Roadster extensions harness. The reason I decided to go with FH020 was because it is the number one most commonly used regulator on all super sport bikes (panigale, r1, cbr, s1000RR) for the past 3 years. It is considerably lighter, smaller, and almost half the cost of the 847. I am still trying to find answers why the new and redesigned ducati v4 panigale, gsx-r and CBR fireblade did not use the SH847 - if we were to assume its better than the FH020. Ducati's are not exactly "high rpm sportbikes". 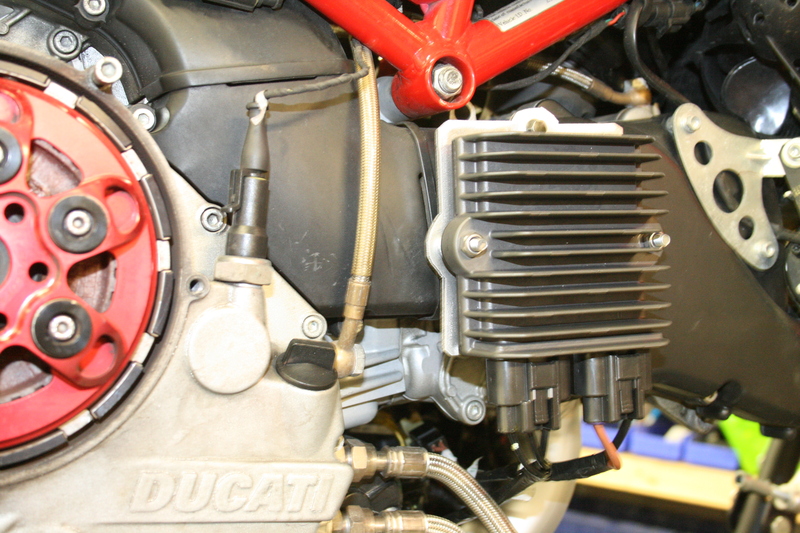 The avg Ducati spends much of its life between 3k and 7.5k rpm. Id call that almost a cruiser. Also, Ive seen the SH847 working on the dyno up to 12,500rpm, with no excess heat or voltage fluctuations. The *apparent* limit of 10k rpm- even if it was true- wouldnt matter in this case, unless you plan on running for extended periods of time over 10k rpm. With the possible exception of Daytona, where are you anywhere near redline for more than *maybe* 2 seconds? There is a good reason why these are not yet common on Sportbikes- the lead time for incorporating these into an electrical system at the OE level is quite long, both from the electrical engineering side, as well as the physical location, and finally costing. I run FH020 on a few of my bikes and they work great, so I still recommend them when space is at a premium, or cost is a big factor. SH847 is a lot more money. Last edited by Jason. ; May 7th, 2018 at 11:01 AM. Did you also get the triumph T2500676 harness? how hard was the installation to bring all the cables over to the other side? That makes sense, i would like a ease of installation as well, could you pm me the price of the bracket as well? i dont need cf, alu would suffice. The sh847 looks huge, it is impossible to fit it without rerouting i suppose? How is the reliability of the fh020 been so far? Ive personally installed between 30-40 of them over the last 10 years and have never seen one fail. This is the main reason that I *always* recommend the Shindengen stuff instead of the aftermarket versions. Their QC is just very, very good. With the bracket from VJ020, I put the new R/R back in the stock location. I happened to have the battery box and wiring harness off the bike at the time, so my experience was a little different than just replacing a unit on a fully assembled bike. But I had zero issue with putting it all together. Jason have you had any trouble with the heat from the R/R transferring to your aluminum bracket being so close to the plastic cam cover? I `m considering a carbon fiber bracket. Last edited by jabberwoki; May 13th, 2018 at 07:22 PM. I `m considering a carbon fibre bracket. No- and Ive measured it using a FLIR camera as well as a simple Fluke temp probe. These were done on dyno, and after a 20 min test ride. One of the main benefits of the MOSFET R/R's is that there is much less heat created. I dont know how much additional heat you would need to see to worry about an aluminum bracket, but I imagine it would be in the triple digit increase range. That simply isnt going to happen with one of these R/R's. Ever. Last edited by krypt0nite; May 8th, 2018 at 02:19 PM.